My name is Laura. My world is wifi and butts. Once, I was a video game reviewer. A lone critic searching for a righteous cause. As the world fell, each of us in our own way was broken. It was hard to know who was more crazy… me… or the video game marketing departments that kept creating brand associated energy drinks. Every day, some vile combination of liquid and caffeine fuels my actions. I may go days without it, but it’s hold on me remains. I push through, waiting for the next day the gods desire to bless me by opening the sugary sweet, refreshing flood gates. 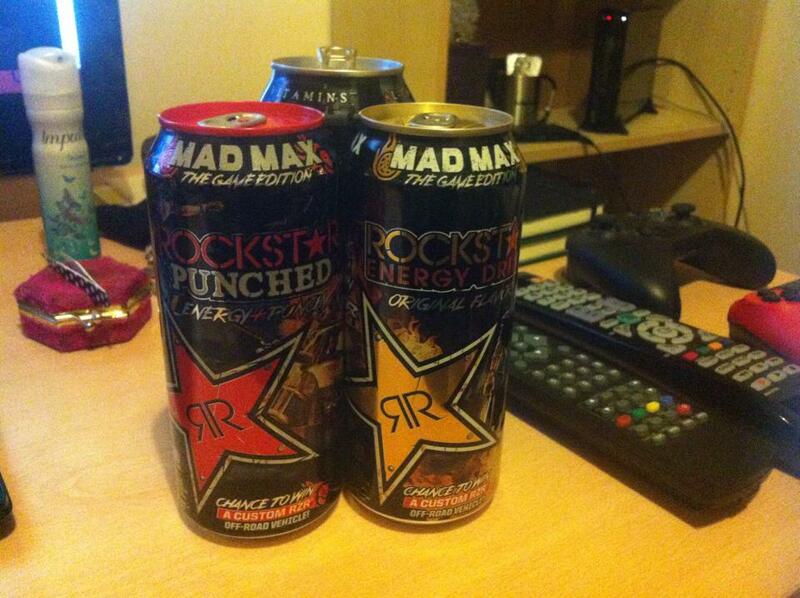 Do not, my friends, become addicted to Mad Max: The Game Edition – Rockstar Punched Energy + Punch (Energy Drink). It will take hold of you, and you will resent its absence! You’ll awake, gripped by thirst. Your head will thump, demanding the vice like grip of caffeine deprivation be unwound. It will stare at you, offering to bring you back to the world of the living. You survived without it in your life, but you can’t imagine doing so again. Mad Max: The Game Edition – Rockstar Punched Energy + Punch (Energy Drink) is your redeemer. It is by its hand you will rise from the ashes of this world. As the mix of cherry, carbon, metallic tint and sparkling corrosion hit my tongue, I felt as if this sweet red nectar might be the solution to life eternal. I fill up a bag and hook it directly to my veins. I set the can on the end of my desk proudly, like a hood ornament displaying the source of my strength. Mad Max: The Game Edition – Rockstar Punched Energy + Punch (Energy Drink) will carry you through the gates of Valhalla. You shall ride eternal. Shiny, and chrome! My mind began to rev like an engine. I put my foot hard to the floor and raced off into the journalistic night. If I’m gonna die, I’m gonna die historic in this can of Fury Road! I definitely have a new favourite section after THAT review!